I absolutely loved this book!! It is written by Mary Ann Winkowski who is the renowned paranormal investigator behind the tv show Ghost Whisperer. Winkowski can only see earthbound spirits - those that haven't crossed over into the light yet. This is different from mediums who can see spirits who have crossed over. I guess even paranormal gifts have their own categories. Her gift also includes being able to 'cross over' earthbound spirits by creating a white light and sending them into it, bringing the spirit peace. This book is extremely well structured and very informative. 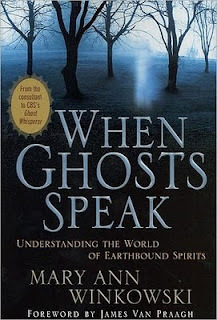 With chapter headings such as: 'the truth behind ghosts' 'why some souls stay behind', 'animals' etc the book covers all aspects of earthbound spirits, from why they stay, to how to protect yourself from attracting them and how to get them to cross over. Winkowski relates particular cases to illustrate her point and she remains on topic. She even lists the most common places to find earthbound spirits, who feed off the energy of the living, and the most popular occupations for attracting earthbound spirits. I could go on and on about this book, because I'm still thinking about it even though I finished it a few days ago, and some of the stories were very touching. Even if you're a non-believer, it would be hard not to be touched by the impact she has on people's lives and how she brings peace to so many spirits and people.